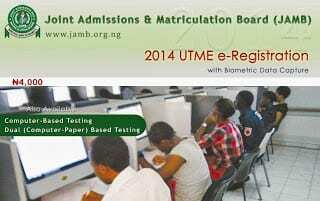 JAMB UTME 2014 Result have been released. Check UTME Result 2014. UTME computer based test (CBT) will start on Saturday, May 17 and end on Saturday, May, 31 2014. Registration for UTME has ended. JAMB Direct Entry Registration is still ongoing Online. Registration for the Unified Tertiary Matriculation Examination, UTME 2014, organised by the Joint Admission and Matriculation Board, JAMB, for admission into tertiary institutions in Nigeria for 2014/2015 academic year has commenced online. JAMB UTME scratch card for accessing the e-registration portal for JAMB UTME 2014 is sold for N4,000 at designated banks. Registration ends on March 9, 2014, so hurry. JAMB UTME e-registration portal is at www.jamb.org.ng/Unifiedtme4/. As usual, you will need Java to access it. JAMB has also announced date for the PPT (paper and pencil test) and DBT UTME exams. UTME 2014 PPT and DBT tests holds on Saturday, April 12, 2014. The UTME CBT (Computer Based Test) starts on May 17 and last for 12 days. The UTME 2014 registration portal got a some user interface changes with colour and the forms moved around. For now it is not clear when the registration will end. Candidates will still be required to visit accredited centres to register with not more than 700 Naira. JAMB Direct Entry registration has also commenced, the JAMB direct entry scratch card is currently 5,000 Naira and Zenith Bank branches nationwide. JAMB Direct Entry e-registration portal is at www.jamb.org.ng/DirectEntry/. Need updates on Jamb UTME 2014 and admissions 2014/2015? UTME 2014 registration scratch card can be be bought at designated banks like UBA, Union Bank, Zenith Bank Access Bank and JAMB offices nationwide. For now, JAMB has not announced the the closing date for the sales of JAMB UTME 2014 Registration scratch cards nor the closing date for registration. We cannot also confirm the date of the exam for now. Like last year, UTME 2014 registration can only be done at the so called JAMB accredited centres, which we have argued is not in the spirit of the openness of the internet and defeating the aim of JAMB Online Registration. Applying to become an accredited registration centre attracts a N10,000 non refundable fee. JAMB UTME 2014 Registration will also require biometric scanner and like last year JAMB states that only the Digital Persona Scanner can be used for fingerprint capure in JAMB UTME 2014 Registration. Like last year, candidates seating for UTME 2014 will have 3 testing options. The first is Computer Based Testing (CBT), which will allow candidates write UTME using a computer and know their result almost immediately. The second is the computer-paper testing, which will allow candidates view questions on computer but answer on paper. The final option is the good old pencil and paper. UTME candidates are expected to choose one of the options during registration. According to JAMB, by 2015 only computer based testing will be available to UTME candidates. After the exams, it will now be time for post UTME 2013. JAMB Direct Entry sratch cards will also be available later in the year for online registration for direct entry admission into 2nd year studies in universities for the 2013/2014 academic year. Find Post UTME 2012 Screening & Admissions Info. Once you buy your JAMB UTME 2013 Registration scratch card, the next step is to visit the JAMB UTME 2013 e-registration portal to download and printout the e-registration form template. The UTME 2013 registration portal is at www.jamb.org.ng/Unifiedtme/. Fill-in the printout form, attach 2 recent passport photographs (less than 3 months) to it and head to an accredited JAMB UTME 2014 registration centre with your UTME 2014 registration scratch card to complete your registration. At the accredited registration centre, an assistant will capture the fingerprints of your two thumbs with a Digital Persona scanner. Note that JAMB warns that only Digital Persona scanner is approved for JAMB UTME 2013 Registration. So, make sure the UTME registration centre is using a Digital Persona Scanner. The assistant at the JAMB UTME 2013 accredited registration centre will also fill in your details and show you a preview page to confirm that all details are correct. After this, he/she will then submit your form and printout two copies of your JAMB UTME Registration slip. The maximum amount that registration centres are allowed to charge per registration is N700 only. The PIN and serial number on your JAMB UTME 2014 Registration will be required during the registration. So, make sure to go with it to the UTME registration centre. Returning JAMB UTME 2013 candidates may not require fingerprint scanner, since their fingerprint is already in JAMB’s database, but they may need to provide their JAMB 2013 registration numbers. Make sure to read the instructions at the registration website before commencing your registration. The JAMB UTME 2014 Brochure is built-into the portal making it easy to search for details of your Jamb UTME courses of choice. Although, we noticed that the link is not working yet. JAMB UTME 2012 Result out. Need updates on Jamb UTME 2013/2014?